Do you want your smile back but are missing some or all of your teeth? Stop hiding your smile and laugh out loud again with dentures from Prairie Village Dentists. Partial or complete dentures are two of the most common teeth replacement procedures. Dentures are very affordable, and they can restore your chewing ability and confidence without long waiting periods. The process is also relatively non-invasive. 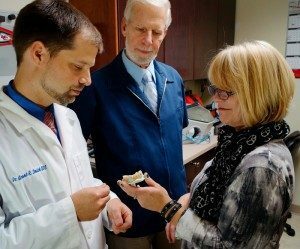 What’s more, modern dentures made at our Prairie Village dental clinic look just like real teeth. Nobody will know that you’ve had a little work done unless you tell them! Dentures are removable appliances that replace lost teeth and soft tissues. A typical denture consists of a gum-colored resin base and resin or ceramic replacement teeth. Thin metal clasps or precision attachments are sometimes used to keep the denture in place. Dentures can be partial or complete. When you have one or more missing teeth, a partial denture fills the isolated gaps. On the other hand, complete dentures are used if all of your teeth are missing in the upper or lower arch. Complete dentures can be placed immediately after the remaining teeth are removed (immediate) or after the gums have healed (conventional). Immediate dentures mean that you won’t have to go without teeth, but this type of denture may need to adjusted later to compensate for shrinking gums. Conventional dentures are made in the lab and fitted after the healing period, about 6-8 weeks after tooth extraction. Overdentures are fixed dentures attached to dental implants or natural teeth. Implant dentures are particularly stable and secure, requiring no adhesives, metal attachments or preparation of natural teeth. Making dentures takes multiple appointments. After the consultation, teeth impressions are taken and a “try-in” wax model is made to check for fit, color and shape. The final denture is then cast and your mouth is prepared (teeth will be removed to accommodate a complete denture). Finally, the denture is fitted and adjusted. For dentures and other teeth replacement options, contact your dentist in Prairie Village, KS!